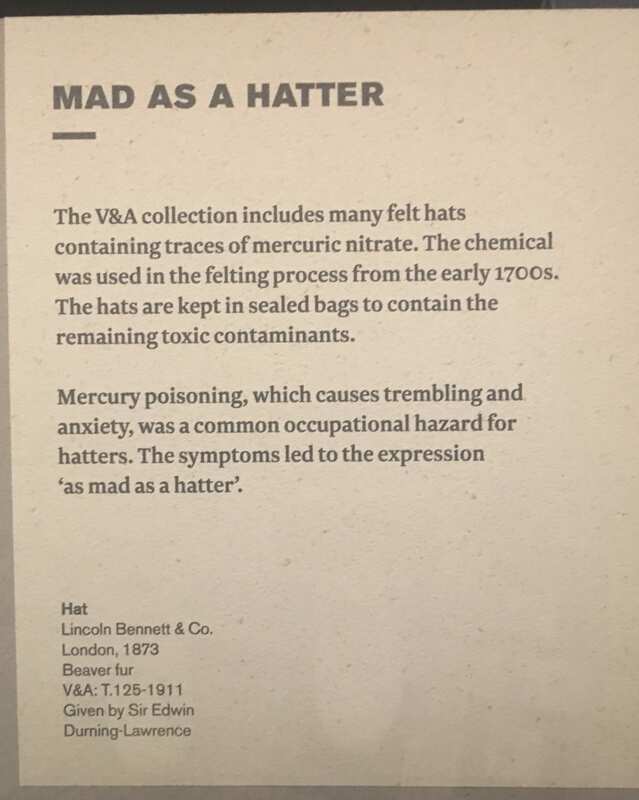 The items on display at the V&A’s Fashioned from Nature exhibition are consistent with what one would expect from the theme of the exhibition. Items inspired by nature, examples of natural fibres compared to synthetic, and how these fabrics affect our everyday lives and morals. However, one object particularly catches the eye and intrigues the mind: a grey top hat concealed within a plastic hazmat bag, with three warning symbols stuck on top. The first question that comes to mind when seeing this object is of course: why on earth is this hat so dangerous? The story behind this hat is common amongst eighteenth century top hats: it cannot be touched, as mercuric nitrate has been used in the felting process. Hatters, when working with some furs such as beaver, which does not bond as easily as wool, would use chemical intervention to make the bonding process easier. 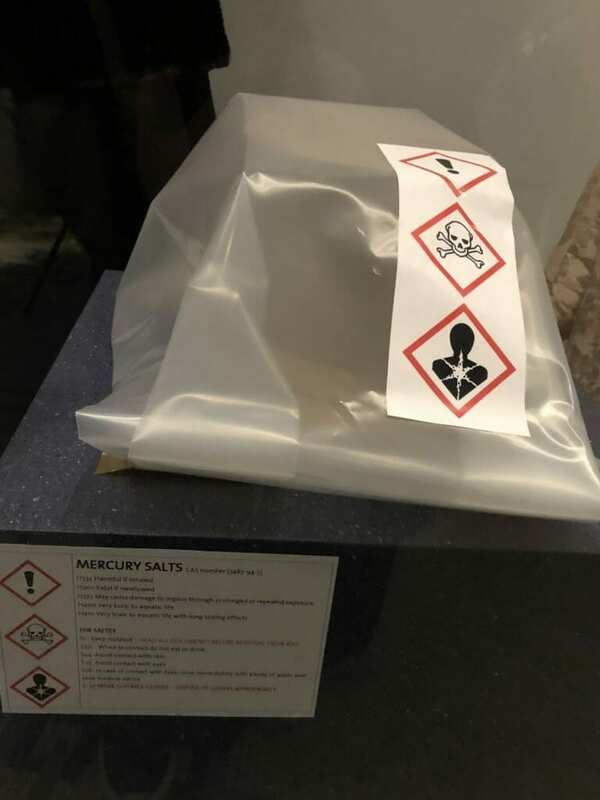 Mercuric nitrate was often used for this. Although it was effective in bonding the fibres, it was also highly poisonous and made the hat makers distinctively ill. 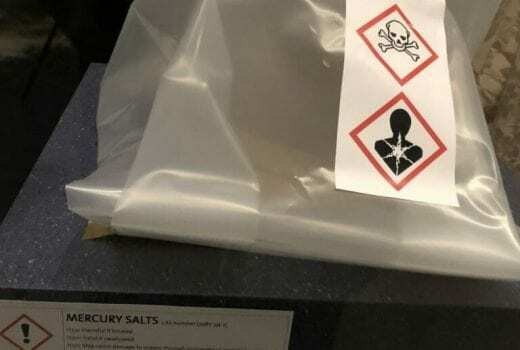 The symptoms of mercury poisoning called ‘erethism mercurialis’ included: shaking, anxiety and visions. This led to the phrase ‘as mad as a hatter’. This item opens our eyes to the devastating effects fashion has had. Just as today there is often pain and suffering behind the clothes we buy. Overall, this particularly stand-out, thought-provoking item sums up the takeaway messages of the exhibition: the impact of fashion on nature, and the impact of nature on fashion. It also provides a very novel take on Alice in Wonderland! 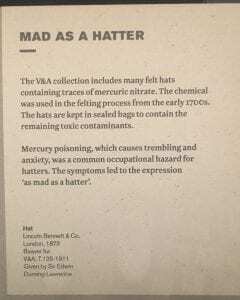 To read more on the subject, the Royal Society of Chemistry provides a concise article on ‘Hatters Disease’. Interesting and entertaining read, thank you.